A cellular renewal booster, Filorga Sleep and Peel Resurfacing Night Cream is ultra-soothing and protective to struggle against prematue aging. A soft, renovated skin, full of energy from waking-up. 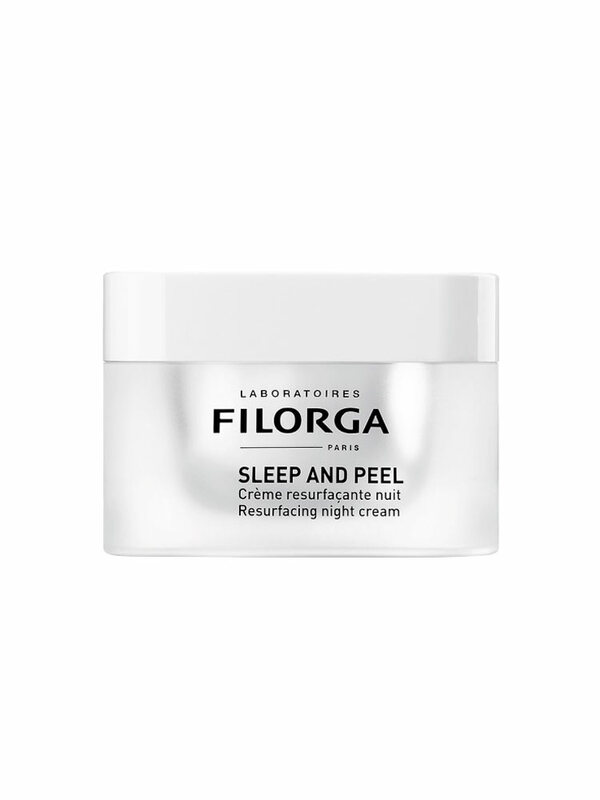 Night after night, the complexion grows glowing and wrinkles grow fade. NCTF + hyaluronic Acid is this care's cocktail, to which is added 6 varieties of acids (AHA and BHA), with different molecular weights, which guarantee a gradual and conrtolled exfoliation. Azelaic acid, encapsulated in liposom, and Pyruvic Acid, ensure a triple moisturising*, anti-comedolysis and antioxidant action. 2 matrikies actions conjugate to a brown alga for effective soothing, protective and anti-aging actions. Skin refinds a genuine glare and an intense softness. Features look rested and pigmentary defects attenuate little by little. Pay attention: this product is without protective film because of its composition. Apply in the evening to the perfectly cleansed face, in continuous use or in alternation 1 days out of 2 for the most sensitive skins. A light tingling is possible after application, which is perfectly normal: The anti-aging ingredients act. Precautions for use: Do not apply to damp skin, around the eye or on wounds. In case of intense feeling of burn, rinse the face with fresh water and stop using this product. Do not apply with other potentially irritating or sensitizing cares. Indication: Lack of glare and softness. Aqua, Glycolic Acid, Propylene Glycol Dicaprylate/Dicaprate, Cyclopentasiloxane, Glycol Palmitate, Cetearyl Alcohol, Ceteareth 20, Glyceryl Stearate, PEG-100 Stearate, Isononyl Isononanoate, Glycerin, Aloe Barbadensis Leaf Juice, Lactic Acid, Sodium Hydroxide, Malic Acid, Chondrus Crispus (Carrageenan) Extract, Pyruvic Acid, Azelaic Acid, Lecithin, Xanthan Gum, Atelocollagen, Sodium Chondroitin Sulphate, Butylene Glycol, Carbomer, Polysorbate-20, Palmitoyl Oligopeptide, Palmitoyl Tetrapeptide-3, Caprylic/Capric Triglyceride , Laminaria Ochroleuca Extract, Sucrose Palmitate, Glyceryl Linoleate, Prunus Amygdalus Dulcis (Sweet Almond) Oil, Sodium Hyaluronate, Tocopherol, Calcium Chloride, Potassium Chloride, Magnesium Sulfate, Sodium Acetate, Sodium Chloride, Sodium Phosphate, Amino But Acid, Glucosamine, Glucose, Glucuronolactone, Glucuronic Acid, Glutathione, 5-Methyl 2' Deoxycytidine, Thiamine Pyrophosphate, Coenzyme A, Sodium Flavin Adenine Dinucleotide, Nicotinamide Adénine Dinucléotide , Sodium Nicotinamide Adénine Dinucléotide Phosphate, Sodium Uridine Triphosphate, Alanine, Arginine, Asparagine, Aspartic Acid, Cystine, Glutamine, Glutamic Acid, Glycine, Histidine, Hydroxyproline, Isoleucine, Leucine, Lysine, Methionine, Ornithine, Phenylalanine, Proline, Serine, Taurine, Threonine, Tryptophan, Tyrosine, Valine, Ascorbic Acid, PABA, Biotin, Calcium Pantothenate, Folic Acid, Inositol, Niacin, Niacinamide, Pyridoxal, Pyridoxine, Riboflavine, Thiamine HCL, Tocopherol Phosphate, Tocopheryl Acetate, Cobalamine, Desoxyadenosine, Desoxycytodine, Desoxyguanosine, Desoxythymidine, Salicylic Acid, Disodium EDTA, Arbutin, Parfum (Fragrance), Phenoxyethanol, Methylparaben, Butylparaben, Ethylparaben, Propylparaben, Isobutylparaben. Active Ingredients: 105 ingrédients, 68% d'actifs. My wife use it based in doctor prescription. Good price. Been using this cream for 2 years. It hydrates and nourishes. I got a sample of this product and after one week I was already convinced to buy it! Your skin stays smooth and illuminated! - Used daily as night routine every day. I use the product daily. Great quality. Good for age +30. Use at night.